Tapity, the winner of an Apple Design Award in 2011 in the student category for their app Grades 2 and Sonico Mobile, who are best known for their translation apps for mobile have teamed up for the design an development of Languages — a beautiful translation app for iPhone. Languages app’s core USP is its offline translation feature. Unlike most other translation apps, Languages can work totally offline as it stores all the data on your phone itself. It features a nifty unified search field, so you can type a word in any language & it is smart enough to give you to correct translation. It even has a index for quick browsing and a comes with 12 language books that are included in the price. The UX of Languages is splendid. It features little lovely animations throughout the app and using the app is very intuitive. There’s a lovely magnifying animation when you scroll your finger on the A-Z index listing in the app, similar to OS X Dock’s magnification but this one is better implemented. It’s fantastic to watch the letters slide out slowly and fall in line behind the others. Toggling between two languages in simple and again, has a lovely animation with the flags on the button in the top right. The animations for when you’re searching is also very well done. The 12 language dictionaries are laid out on a wooden shelf and can be moved or rearranged by tapping and holding down on them. I find myself spending my time just browsing through different words in Italian and German, although I wish Languages has text-to-speech built into it. The app is available today for just $0.99 on the App Store and has already been updated for the iPhone 5. 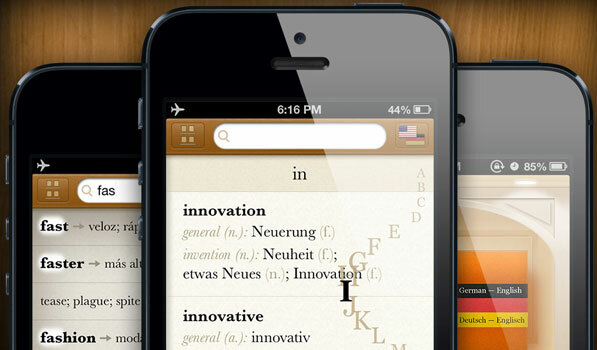 The 12 Language Dictionaries are included in the price, but do not ship with the app to reduce the size of the app. You can just tap on them to start the download automatically.